Due to climate change we experience more extreme weather, such as heavy rain, storms and droughts. Instead of being paralysed by Judgement Day visions for the future we need to embrace the environmental changes and work with them in a positive way in order to turn what seems to work against us into something that we can benefit from. We need to start a new positive discourse if we want to make a change towards a more sustainable future. 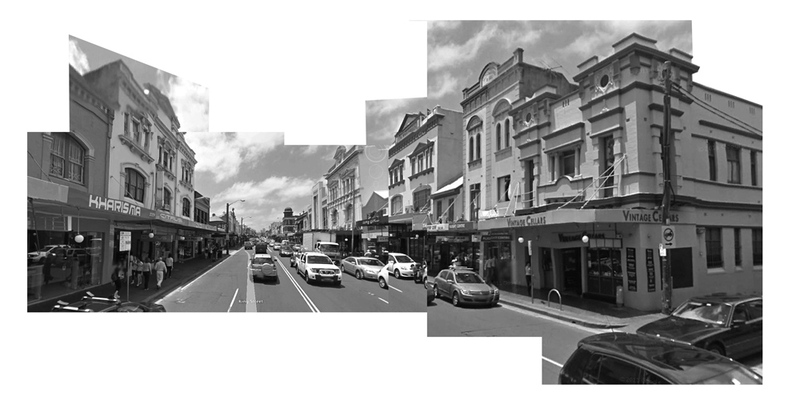 The traditional Australian street section has a lot of qualities, such as the open ground floor, the overhang, which gives protection from the sun and the rain, the human scale of the buildings, and the space in between. But how can we upgrade this section in order for us to benefit from global climate change and extreme weather conditions? To start, we need to look at what we have to work with. The existing building structure with the overhang gives us an opportunity to make green roofs in order to collect rainwater to reuse in the household. This will upgrade the living situation and the value of the property, and at the same time it adds to the life in the streets. The next thing we need to consider is the impervious conditions of our cities. To avoid storm water runoff we need to make our cities more permeable and green. 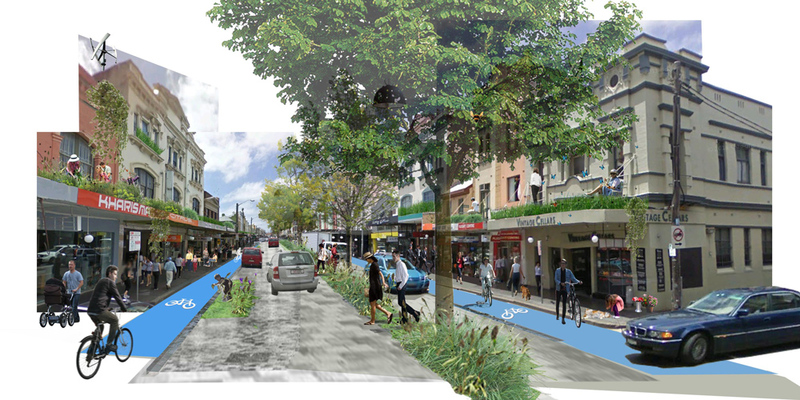 So by creating a green dividing strip for slow seepage we avoid some of the pollution from storm water runoff and add more nature value to our streets. Research shows that people who live in close proximity to green space live a healthier life and are less stressed. But because space is scares we need to use the term “green infrastructure” and consider it as being just as important in our cities as roads, sewerage, electricity and water. By taking out the parking space and introducing bike lanes in both directions we improve the conditions for biking and thereby improving both peoples health and the environment. And by dividing the bike lane with the road by a water ditch we optimise safety, and at the same time we are able to prolong the presents of water in urban space as an aesthetic quality. Finally we suggest solar panels and windmills on the roofs in order to benefit from the energy resource of the sun and wind. So by looking at the climate changes as a positive and turn the challenges into possibilities by making a few changes to the existing build environment we benefit both environmentally, health wise and aesthetically.